To anyone who predicted that shifting demographics spelled the end of Republican electoral dominance in Shelby County: the subjects of that prediction apparently did not get the message. Even before the GOP's countywide sweep became apparent, the mood at Republican nominee Bill Oldham's headquarters in East Memphis was jubilant. Dining on pizza and pasta from Garibaldi's, the crowd of about 150 supporters erupted in cheers each time Oldham's ebullient daughter, Katie Fik, took to the podium to read the current vote totals. As numbers continued to show Oldham with a comfortable lead, attention turned to the other county races. About a dozen supporters watched the figures from the Election Commission roll in at one side of the room, heads nodding in approval with each update of the screen. At another monitor, a small group of about twenty stopped momentarily to watch the spectacle of former mayor Willie Herenton conceding the election to Congressman Steve Cohen. Though the sound was off and his words could not be heard, the sight of the former mayor's historic concession nevertheless commanded the attention of anyone who chanced to be passing by. Finally, at ten o'clock, once nearly all the precincts had reported, the Sheriff-elect appeared onstage, surrounded by at least twenty family members, all of whom, it seemed, had worked on the campaign on some capacity or another. Indeed, when delivering the exordium of thank-you's customary to all such political speeches, Oldham took nearly a full minute to recite the names of those family members who volunteered, concluding to laughter and applause, "As you can see, I got quite a few votes right here." 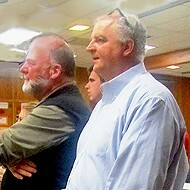 Curiously, when it came time to thank what Oldham referred to as "my management team," he did not mention the young Robert Callahan at all, who was introduced to this reporter as the campaign director, but instead singled out Jeff Sullivan, a former aide to Democratic State Senator Jim Kyle and onetime Democratic candidate for House District 89. It is worth noting here that during that special election in 2003, Sullivan, who declined to be interviewed, referring to himself as "a low-key guy," was the target of an intense and vigorous residency challenge on the part of none other than Congressman Steve Cohen, at the time a state senator acting on behalf of candidate Beverly Marrero. This marks the second time the two men have found themselves on opposite sides of a heated election, as Cohen campaigned nearly as hard for Oldham's opponent, Democratic nominee Randy Wade, as he did for himself. Whoever was in fact running the campaign, they were no doubt helped considerably by the seemingly unlimited volunteer manpower provided by the extended Oldham clan, along with the families of his friends and supporters. With only three paid staff to run a countywide campaign, the remaining force of Oldham's sizable crew were unpaid volunteers, most of whom were related to one another in some fashion. "At least 40 family members were involved," according to Katie Fik. "I've never seen my mother work so hard in my entire life." Nor was hers the only family putting in time for the candidate. Eddie Barton, a volunteer and supporter, described how he, his wife, and his sons all put in work for the campaign. "Nobody got anything out of it. We don't expect anything out of it. We did it because he's an honest man, and he's a good man." This was a notion seconded by Callahan, who lauded his candidate's decision to resign from his position as Chief Deputy in order to avoid a possible violation of the Hatch Act, which forbids federal employees from engaging in partisan political activity. Because the Shelby County Sheriff's Office receives federal money, some interpretations of the law have held that a deputy would technically fall under its scope. Oldham does not believe he would have been offered a job under a Wade administration ("Absolutely not! "); thus Callahan described the move as "a sacrifice for the citizens of Shelby County." "We could have gone through a long process of contesting that, at which time if [the Election Commission] found against me, there could have been some monies that the county would have had to have paid," Oldham said. "I did not want to put our campaign through that process, I did not want to risk the citizens of Shelby County possibly having to pay for that, so I did what was right, and I retired." Near the end of the night, as the chairs were being folded and the food put away, interim County Mayor Joe Ford made a congratulatory appearance, having just done the same at Luttrell headquarters to a thunderous ovation. Ford was no less well-received at Oldham headquarters, earning a loud hurrah as he entered the room. Absent from this scene was opponent Randy Wade, from whom Oldham reported he had not yet received a phone call. As it turned out, Wade had not conceded the election. "No, I did not concede," he announced, Cohen at his side, to a small group of supporters who lingered behind late into the night at Minglewood Hall, the scene of Cohen’s victory party. "We don't know how many provisional ballots there are," he continued, "and so we want to wait until [the Election Commission] signs off on that, and if it comes back that we did not win, then I will be the first to humbly and professionally concede."